The art of simple living - Voluntary Simplicity - is a lifestyle choice that many of us have already made. Then there are those who are moving towards it, given economical pressures. Voluntary Simplicity has often been confused with forcing yourself to live in poverty or leading an overtly frugal life, which it is not. There are as many definitions as there are practitioners of Voluntary Simplicity, which traces its roots to the days of the Buddha. The focus is on inner happiness through Less is More rather than how much more can I have and what else can I get. Well, that is this muddled practitioner's definition. What is the idea behind this theme? 1. To explore minimalism in cooking. 2. To appreciate the pure taste of ingredients and flavors as themselves. 3. To understand the role of each ingredient in any recipe. I will always love to both cook and eat elaborate creations, but sometimes it is magical to see how a handful of ingredients can come together into a great dish with the right recipe. I love it! Especially since that is the underlying theme of my cooking. There are very few recipes that I make on a regular basis that are complicated or have more than a few ingredients. Most of the time, all it takes is a fresh vegetable, and a khamang phodni. In the bumper loot that I carried away from the Louisville Farmer's Market recently, I had two types of kohlrabi, green and purple. Both are white on the inside and I really couldn't tell the difference in flavor and taste. My mother used to make navalkolachi bhaji but I had only ever gobbled it down and never paid attention to how she made it. First, I tried to deconstruct it in my mind and then went blog-hopping to see who might have the nearest recipe. I had a feeling it would be Vaishali, the Happy Burper, who has unfortunately been so immersed in offline pursuits that we haven't seen or heard from her since she moved back to India from Germany about a year ago. I hope she revives her blog as she was Queen of Word Play! Soak the chana dal in about 1/2 cup of water for an hour or so. Wash and peel the kohlrabi so that all tough fibers are discarded. Slice it long and slender, rather like french fries, so that it cooks quickly. Heat the oil in a kadhai and when hot, add mustard seeds. When the mustard seeds start popping, add asafetida, turmeric powder and red chilli powder. Move quickly at this point and add the chana dal and kohlrabi and mix well. If you linger, both the turmeric powder and red chilli powder will burn. Turn off the heat, if you have to. Add about 1/2 cup of water. Cover and cook until the kohlrabi has cooked until it is tender but not soggy or overcooked, about 15-20 minutes. The soaked dal will also cook within this same time. If required, add more water. I made more than a few changes to Vaishali's recipe but the essence remained the same. Instead of a jeera phodni, I used mustard seeds and hing as that is what my mother used. I also preferred to slice the kohlrabi rather than dice it for the same reason. I added a tomato as it was very close to the end of its useful life in the refrigerator. I did not pressure cook the kohlrabi as it was very tender and would have turned into mush had I done that. The chana dal was also very tender and did not need much coaxing to cook quickly. Since Nupur allows phodni to be counted as one ingredient: oil, mustard seeds, asafetida, turmeric powder and red chilli powder are all being grouped together as phodni. A very simple but delicious and rather fulfilling recipe! There's no need to worry about the lack of kadipatta or the pathetic quality, if available. There's no need to freak out about ginger for $6.99/lb at the local Safeway. Or rushing to the Indian grocer to get the last few dry knobs of ginger that other eager beavers left behind when they emptied the box of $1.49/lb ginger. Just open your masala box and you have what you need for the phodni. Add a fresh vegetable, a souring agent, a sweet touch if you wish and you're all set. Putting it down Nupur-style: kohlrabi + chana dal + phodni + tomato + sugar. How's that for Less is More? Extend the simple living philosophy to your cooking styles and eating habits and you will soon be eating healthy. Simple meals reduce both cooking time as well as the clean-up thereafter. As for the rest of your life - if you haven't already then, start small, keep it simple - but start somewhere. The more we lead our lives towards sustainable living, the better the health of the planet we leave behind for our children. Remember that simple living is about making conscious choices to lead a better and healthier life. It's about reaching that place within oneself and finding a balance where we realize and recognize what we need and live within those parameters. You can also join Jack in his journey to breaking free of material encumbrances, including debt. And glean more wisdom and tips from the inspiring blog, Choosing Voluntary Simplicity. And, don't forget to read about my ordeal, Don't Let the Bed Bugs bite, over at The Daily Tiffin. So that's what you do with kohlrabi! I confess I bought that one just because it looked interesting. When you're paying for produce by the bag, what the heck, just throw in a bunch of everything and figure it out later, right? Kitt, it's just one of the things you could do with kohlrabi. I needed a fix from memory lane so I had to make this. Otherwise, to keep it even simpler, you can grate it and make a slaw as it can be eaten raw. It's from the Brassica family and has a very radish-like taste and crunch. Manisha , Im still subscribed to happy burp hoping she will one day come back to blogging regularly. Her's was one of the first blogs which I stumbled upon and has been a favorite ever since. Your kohlrabi sabji looks delicious, Im yet to explore this wonder . I have limited myself to poriyal and sambhar till now. I am regular reader of ur blog but never dropped a comment so far. I must say you "Many Thanks" for that article how to keep our herbs fresh and longer? I did follow ur tips and I found that the cilantro can be fresh upto 4 weeks in fridge.Thank you very much for ur handy and valuble tips. I always wud follow it for herbs. Hey Manisha my mom too used to make navalkol like u make minus tomato and sugar. I find this veg very strong for my taste so I never buy it. Very nice- both your exposition of voluntary simplicity and the recipe. As I read the recipe I was actually thinking: hmmm, where's the jeera? (because I am fond of the mirch-haldi-hing-jeera quad) Mustard seeds eh? Tomatoes and a bit of sugar... sounds like a great, delicate sweet-sour treat...lets the kohlrabi flavour shine through... and I can forcast that this would go over well in this house, so...will be giving it a try. Perfect, perfect! What a great post, Manisha. I love what you have to say: "all it takes is a fresh vegetable, and a khamang phodni". I have to introduce Kohlrabi to my family yet. I will surely try this recipe and thank you for sharing it. I think, "Frugality" doesn't mean "Living in Poverty". It is reducing the waste, using the available resources wisely and not buying unwanted things. Sometimes "Frugality" is confused with "Misery". What do you think? 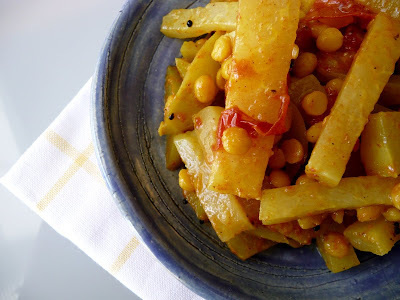 Love this recipe, especially the chana dal part, it just elevates kohlrabi to a different level! 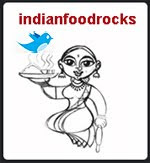 On that note, i would love to try it with some moong or chavli sprout as well! I've always seen this weird looking veg but never thought to cook it. Until last week when my veg seller insisted I should buy it. I gave in and cooked it for the first time and it wasn't to bad. Now i've got one more recipe. Thanks. Navalkol was not a favourite of mine but I developed a taste for it & used to have it whenever my Mom made it. But now that I dont get it easily here I am missing it! Your simple recipe makes me want to search for Navalkol even more! 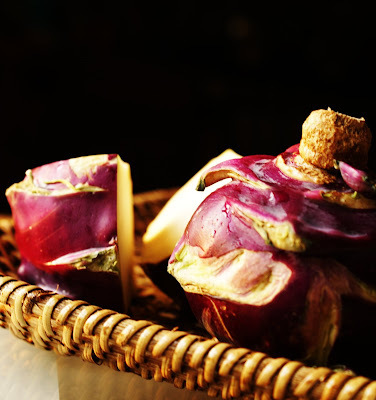 Manisha, I just resumed cooking with kohl rabi after a couple of experiments years and years ago, and when I saw this, I had to make it. So I made it today. I did away with the sugar and added some garam masala at the end on my aunt's suggestion - thanks for the easy, well-written recipe. This is definitely a new way for me to use this ingredient. The next time I put my hands on some, I'll try your recipe. Kohl-rabi is one of my fave veggies - prepared the haak-way, with all that salty broth, over rice. Can be turned into a great Kashmiri pickle too. This is pretty much how my MIL prepared it (thought without the tomato - tomatoes are easy to freeze - just throw them in the freezer!). Now take out the deep fryer for a simply frugal batata vada. Ok..where is my comment :((( ? I am going to try this soon... I think I had tasted this in Belgaum and loved it.